Art and Audubon have a rich history. This dates all the way back to John James Audubon, whose wide acclaim as a painter helped raise awareness about these species and inspire international bird conservation efforts. Maine Audubon continues to draw on this legacy by featuring the work of local photographers and painters on the walls at our education centers, in the pages of our guides and reports, and for sale in our retail stores. Our relationship with the Maine College of Art (MECA) is an important part of that commitment today. Many MECA alumni have made wildlife conservation a focus of their work. Several have also partnered with Maine Audubon. Jada Fitch ‘06 illustrates our children’s books and other projects; Chris Patch’s ‘97 migration installation anchors the “Modern Menagerie” at Portland Museum of Art; and Hannah Rosengren’s ‘15 pollinator graphics helped illustrate our early “Bringing Nature Home” materials. Two years ago, Maine Audubon Education Director Eric Topper was invited by Annie Seikonia, founder of the Portland Pollinator Partnership who also works at MECA, to attend a MECA presentation. MECA students were presenting mock grant proposals about pollinator conservation they had prepared in a math class taught by Bob Jenkins. It was clear that MECA wasn’t just producing art and artists, but forging leaders, activists, and messengers focused on addressing pressing local issues. Next, Eric met with MECA’s Director of Public Engagement Elizabeth Jabar. Elizabeth explained her additional goal of developing deep, ongoing relationships in Greater Portland for instructors and students. Then he connected with MECA instructor Michel Droge, an accomplished contemporary artist in her own right. Much of Michel’s art focuses on serious and sometimes dire environmental themes such as climate change and impacted landscapes. She was teaching a course for second year students that fall, and thought of Maine Audubon as a rich source of subject matter and inspiration for students to create woodblock prints in the tradition of Chinese propaganda art — bold images and colors, few or no words, and designed to evoke action. Eric collaborated with Michel, working with that class (and again with another this fall) to teach them about Maine Audubon’s mission and work and to help them select themes for their prints that align with our conservation priorities. In return, Maine Audubon has been the beneficiary of these powerful student products and the messages they convey. We also worked directly with Bob Jenkins’ math class last spring, providing content around which to base their mock grant proposals. This fall, Michel Droge has repeated the Maine Audubon woodblock print project with a new group of second-year students. 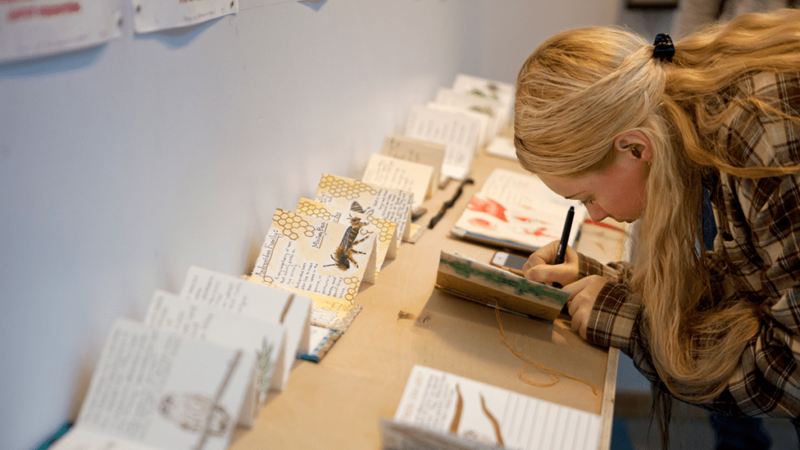 In addition, she developed another class for first-year students in which they produced handmade nature journals and field guides after visiting and learning about Maine Audubon. The results and products from both classes are stunning, and yet another example of how much “the next generation” of conservation leaders and activists has already accomplished and contributed today. Two classes of incredible MECA student work will be displayed in the gallery at Gilsland Farm beginning this weekend, with an opening reception on Friday evening, October 27. Please join us in appreciating this beautiful art, congratulating these amazing young people, and celebrating this vital community partnership!